Cardfight!! Vanguard and I go back a long way. I’ve been playing this game since the release of the Japanese edition of Eclipse of Illusionary Shadows first came out – that’s what, coming to 4 years now? My very first deck was a Shadow Paladin deck that I still have with me to this day. Throughout my time as a player, I’ve seen the game change and evolve, and watched different decks rise and fall. Some cards have made an impact on the game and left their mark forever, while others have faded into oblivion. Several of these cards have left an impression on me throughout these years of play, and in this series of articles, I’d like to share some of these cards with you guys. I’ll be picking one card from every clan that has existed from before Cardfight!! Vanguard G, and I’ll be talking a little about each card and why I think these cards are noteworthy. Let’s kick this off with some of the United Sanctuary clans! Of course, I’ll be starting with my first clan, Shadow Paladin! Skull Witch, Nemain is probably one of the most unique cards in the whole game. While draw-based effects usually have a sizable cost (at that point in the game, anyway), Nemain offers the players a 2 card draw for the low, low cost of 1 Counterblast and 1 card from the hand. In return, she suffers a massive cut in power – the only other cards that have 3000 power are triggers (Battleraizer and Lozenge Magus). Despite this, Nemain’s unique strength actually helped the Shadow Paladin deck of old. Phantom Blaster Dragon required the player to retire their own rear-guards to activate its effect, and Nemain is the perfect target – after using its effect, it can be used as part of the cost to use Phantom Blaster Dragon’s ability. This card is not without drawbacks, of course – with its low power, it needs a Boost with at least 6000 power to allow it to even attack other Grade 2 rear-guards, which on average have 9000 power. The most notorious problem, of course, is when the player is forced to ride it at Grade 2. Not only do you have a terrible attack and defense, you can’t even use its ability! Despite this, I feel Nemain was one of the more intriguing cards that were released, even to this day. With the Witch archetype, she is even given a new lease of life! Most players have shifted to using Black-winged Swordbreaker as a replacement for draw, so it’s nice that such an old card has found a place in more updated decks. Majesty Lord Blaster is the first card in the game to encourage mixed clan decks. Back then (I feel old now), there was no Clan Fight regulation, and players could freely experiment with mixed clan decks (like the Mr. Invincible + Dragonic Overlord combo), but this was one of the only cards that actually needed the player to use cards outside of the primary clan in order to use its effect. This also encouraged, to a certain extent, the use of cards like Knight of Nullity, Masquerade and Apocalypse Bat from Shadow Paladin in the Majesty Lord Blaster deck. Various builds of the deck emerged, and it was fun to see what direction each player steered their decks in. There were even Majesty Lord Blaster decks that forgo the traditional Royal Paladin start, and used a base of Shadow Paladin cards instead with Blaster Blade splashed in, as well as some other support cards like Knight of Loyalty, Bedivere and Wingal Brave. Majesty Lord Blaster was also one of the first of cards that had more than 11000 power on the opponent’s turn. At the point of its release, only 3 cards could do this – Majesty Lord Blaster, Phantom Blaster Overlord, and the infamous Dragonic Overlord the End. While not considered a traditional Crossride (Crossrides have 13000 power), Majesty Lord Blaster sacrifices that 1000 power for a permanent +1 Critical. Then, it was still fairly common for cards to have 10000 power, and having a higher power meant it was easier to break through the opponent’s defense and guard against the opponent’s attacks. Lozenge Magus, along with Battleraizer, are two of a kind. They are recyclable triggers that can be used as a starting vanguard due to their prototype Forerunner abilities. In terms of deckbuilding, this is a very important point, as you do not need to dedicate a slot in your deck for another Grade 0 card. Granted, you won’t have access to some of the stronger effects that most starting vanguards have, but opening up just one slot in the deck can help you fit another key card in, such as Silent Tom or Maiden of Libra. Lozenge Magus, however, could possibly considered superior to Battleraizer – Heal triggers, as every fighter knows, are restricted to only 4 per deck. The fact that you can send a Heal trigger back to the deck was reason enough to run this outside of a Tsukuyomi deck. This set up situations where you could heal more than 4 times in a single game, much to the chagrin of your opponents. In an age without Legion, this ability was also one of the only things that let you replenish your deck if you happen to play into the later stages of the game, and are running out of cards in the deck. There was also a build in the past focusing on making the opponent draw out, featuring Oracle Guardian, Blue Eye, Goddess of Flower Divination, Sakuya, and Dark Cat. Lozenge Magus helped to fuel this deck, as it could repeatedly return to the deck after being drawn or triggered, allowing the player to maintain a deck size advantage and effectively mill out the opponent. And with that, we come to the end of today’s walk down memory lane. Talk about nostalgic! What are some of the older cards that you would have featured? In the next article, I’ll be looking at the last few United Sanctuary clans (Angel Feather, Genesis, and Gold Paladin), after which we’ll be moving on to the other nations! Stay tuned! An avid card gamer who dabbles a little in every card game he can get his hands on. Considers weakness a sin. Thinks that the weak ones should just go home. 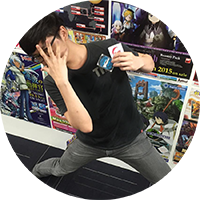 The Cardfighter’s Column publishes every Friday, featuring Cardfight!! Vanguard news, card insights, event updates and more! Do you have any suggestions? What would you like to see in future column articles? Drop us a line on Facebook or through email at sg_support@bushiroad.com!